1. On 22 January 2013, the Department of Foreign Affairs of the Republic of the Philippines presented a note verbale to the Embassy of the People' s Republic of China in the Philippines, stating that the Philippines submitted a Notification and Statement of Claim in order to initiate compulsory arbitration proceedings under Article 287 and Annex VII of the United Nations Convention on the Law of the Sea ( 'Convention' ) with respect to the dispute with China over 'maritime jurisdiction' in the South China Sea. On 19 February 2013, the Chinese Government rejected and returned the Philippines' note verbale together with the attached Notification and Statement of Claim. The Chinese Government has subsequently reiterated that it will neither accept nor participate in the arbitration thus initiated by the Philippines. 2. This Position Paper is intended to demonstrate that the arbitral tribunal established at the request of the Philippines for the present arbitration ( 'Arbitral Tribunal' ) does not have jurisdiction over this case. It does not express any position on the substantive issues related to the subject-matter of the arbitration initiated by the Philippines. No acceptance by China is signified in this Position Paper of the views or claims advanced by the Philippines, whether or not they are referred to herein. Nor shall this Position Paper be regarded as China' s acceptance of or participation in this arbitration. Consequently, the Arbitral Tribunal manifestly has no jurisdiction over the present arbitration. Based on the foregoing positions and by virtue of the freedom of every State to choose the means of dispute settlement, China' s rejection of and non-participation in the present arbitration stand on solid ground in international law. 4. China has indisputable sovereignty over the South China Sea Islands (the Dongsha Islands, the Xisha Islands, the Zhongsha Islands and the Nansha Islands) and the adjacent waters. Chinese activities in the South China Sea date back to over 2,000 years ago. China was the first country to discover, name, explore and exploit the resources of the South China Sea Islands and the first to continuously exercise sovereign powers over them. From the 1930s to 1940s, Japan illegally seized some parts of the South China Sea Islands during its war of aggression against China. At the end of the Second World War, the Chinese Government resumed exercise of sovereignty over the South China Sea Islands. Military personnel and government officials were sent via naval vessels to hold resumption of authority ceremonies. Commemorative stone markers were erected, garrisons stationed, and geographical surveys conducted. In 1947, China renamed the maritime features of the South China Sea Islands and, in 1948, published an official map which displayed a dotted line in the South China Sea. Since the founding of the People' s Republic of China on 1 October 1949, the Chinese Government has been consistently and actively maintaining its sovereignty over the South China Sea Islands. Both the Declaration of the Government of the People' s Republic of China on the Territorial Sea of 1958 and the Law of the People' s Republic of China on the Territorial Sea and the Contiguous Zone of 1992 expressly provide that the territory of the People' s Republic of China includes, among others, the Dongsha Islands, the Xisha Islands, the Zhongsha Islands and the Nansha Islands. All those acts affirm China' s territorial sovereignty and relevant maritime rights and interests in the South China Sea. 5. Prior to the 1970s, Philippine law had set clear limits for the territory of the Philippines, which did not involve any of China' s maritime features in the South China Sea. Article 1 of the 1935 Constitution of the Republic of the Philippines, entitled 'The National Territory' , provided that 'The Philippines comprises all the territory ceded to the United States by the Treaty of Paris concluded between the United States and Spain on the tenth day of December, eighteen hundred and ninety-eight, the limits which are set forth in Article III of said treaty, together with all the islands embraced in the treaty concluded at Washington between the United States and Spain on the seventh day of November, nineteen hundred, and the treaty concluded between the United States and Great Britain on the second day of January, nineteen hundred and thirty, and all territory over which the present Government of the Philippine Islands exercises jurisdiction.' Under this provision, the territory of the Philippines was confined to the Philippine Islands, having nothing to do with any of China' s maritime features in the South China Sea. Philippine Republic Act No. 3046, entitled 'An Act to Define the Baselines of the Territorial Sea of the Philippines' , which was promulgated in 1961, reaffirmed the territorial scope of the country as laid down in the 1935 Constitution. 6. Since the 1970s, the Philippines has illegally occupied a number of maritime features of China' s Nansha Islands, including Mahuan Dao, Feixin Dao, Zhongye Dao, Nanyao Dao, Beizi Dao, Xiyue Dao, Shuanghuang Shazhou and Siling Jiao. Furthermore, it unlawfully designated a so-called 'Kalayaan Island Group' to encompass some of the maritime features of China' s Nansha Islands and claimed sovereignty over them, together with adjacent but vast maritime areas. Subsequently, it laid unlawful claim to sovereignty over Huangyan Dao of China' s Zhongsha Islands. In addition, the Philippines has also illegally explored and exploited the resources on those maritime features and in the adjacent maritime areas. 7. The Philippines' activities mentioned above have violated the Charter of the United Nations and international law, and seriously encroached upon China' s territorial sovereignty and maritime rights and interests. They are null and void in law. The Chinese Government has always been firmly opposed to these actions of the Philippines, and consistently and continuously made solemn representations and protests to the Philippines. First, China' s assertion of the 'historic rights' to the waters, sea-bed and subsoil within the 'nine-dash line' (i.e., China' s dotted line in the South China Sea) beyond the limits of its entitlements under the Convention is inconsistent with the Convention. Second, China' s claim to entitlements of 200 nautical miles and more, based on certain rocks, low-tide elevations and submerged features in the South China Sea, is inconsistent with the Convention. Third, China' s assertion and exercise of rights in the South China Sea have unlawfully interfered with the sovereign rights, jurisdiction and rights and freedom of navigation that the Philippines enjoys and exercises under the Convention. 9. The subject-matter of the Philippines' claims is in essence one of territorial sovereignty over several maritime features in the South China Sea, which is beyond the scope of the Convention and does not concern the interpretation or application of the Convention. Consequently, the Arbitral Tribunal has no jurisdiction over the claims of the Philippines for arbitration. 10. With regard to the first category of claims presented by the Philippines for arbitration, it is obvious that the core of those claims is that China' s maritime claims in the South China Sea have exceeded the extent allowed under the Convention. However, whatever logic is to be followed, only after the extent of China' s territorial sovereignty in the South China Sea is determined can a decision be made on whether China' s maritime claims in the South China Sea have exceeded the extent allowed under the Convention. 11. It is a general principle of international law that sovereignty over land territory is the basis for the determination of maritime rights. As the International Court of Justice ( 'ICJ' ) stated, 'maritime rights derive from the coastal State' s sovereignty over the land, a principle which can be summarized as 'the land dominates the sea' ' (Maritime Delimitation and Territorial Questions between Qatar and Bahrain (Qatar v. Bahrain), Merits, Judgment of 16 March 2001, I.C.J. Reports 2001, p. 97, para. 185; cf. also North Sea Continental Shelf (Federal Republic of Germany/Denmark; Federal Republic of Germany/Netherlands), Judgment of 20 February 1969, I.C.J. Reports 1969, p. 51, para. 96; Aegean Sea Continental Shelf (Greece v. Turkey), Jurisdiction of the Court, Judgment of 19 December 1978, I.C.J. Reports 1978, p. 36, para. 86). And, '[i]t is thus the terrestrial territorial situation that must be taken as starting point for the determination of the maritime rights of a coastal State' (Qatar v. Bahrain, I.C.J. Reports 2001, para. 185; Territorial and Maritime Dispute between Nicaragua and Honduras in the Caribbean Sea (Nicaragua v. Honduras), Judgment of 8 October 2007, I.C.J. Reports 2007, p. 696, para. 113). Recently the ICJ again emphasized that '[t]he title of a State to the continental shelf and to the exclusive economic zone is based on the principle that the land dominates the sea' , and that 'the land is the legal source of the power which a State may exercise over territorial extensions to seaward' (Territorial and Maritime Dispute (Nicaragua v. Colombia), Judgment of 19 November 2012, I.C.J. Reports 2012, p. 51, para. 140). 12. The preamble of the Convention proclaims 'the desirability of establishing through this Convention, with due regard for the sovereignty of all States, a legal order for the seas and oceans' . It is apparent that 'due regard for the sovereignty of all States' is the prerequisite for the application of the Convention to determine maritime rights of the States Parties. 13. As far as the present arbitration is concerned, without first having determined China' s territorial sovereignty over the maritime features in the South China Sea, the Arbitral Tribunal will not be in a position to determine the extent to which China may claim maritime rights in the South China Sea pursuant to the Convention, not to mention whether China' s claims exceed the extent allowed under the Convention. But the issue of territorial sovereignty falls beyond the purview of the Convention. 14. The Philippines is well aware that a tribunal established under Article 287 and Annex VII of the Convention has no jurisdiction over territorial sovereignty disputes. In an attempt to circumvent this jurisdictional hurdle and fabricate a basis for institution of arbitral proceedings, the Philippines has cunningly packaged its case in the present form. It has repeatedly professed that it does not seek from the Arbitral Tribunal a determination of territorial sovereignty over certain maritime features claimed by both countries, but rather a ruling on the compatibility of China' s maritime claims with the provisions of the Convention, so that its claims for arbitration would appear to be concerned with the interpretation or application of the Convention, not with the sovereignty over those maritime features. This contrived packaging, however, fails to conceal the very essence of the subject-matter of the arbitration, namely, the territorial sovereignty over certain maritime features in the South China Sea. 15. With regard to the second category of claims by the Philippines, China believes that the nature and maritime entitlements of certain maritime features in the South China Sea cannot be considered in isolation from the issue of sovereignty. 16. In the first place, without determining the sovereignty over a maritime feature, it is impossible to decide whether maritime claims based on that feature are consistent with the Convention. 17. The holder of the entitlements to an exclusive economic zone ( 'EEZ' ) and a continental shelf under the Convention is the coastal State with sovereignty over relevant land territory. When not subject to State sovereignty, a maritime feature per se possesses no maritime rights or entitlements whatsoever. In other words, only the State having sovereignty over a maritime feature is entitled under the Convention to claim any maritime rights based on that feature. Only after a State' s sovereignty over a maritime feature has been determined and the State has made maritime claims in respect thereof, could there arise a dispute concerning the interpretation or application of the Convention, if another State questions the compatibility of those claims with the Convention or makes overlapping claims. If the sovereignty over a maritime feature is undecided, there cannot be a concrete and real dispute for arbitration as to whether or not the maritime claims of a State based on such a feature are compatible with the Convention. 18. In the present case, the Philippines denies China' s sovereignty over the maritime features in question, with a view to completely disqualifying China from making any maritime claims in respect of those features. In light of this, the Philippines is putting the cart before the horse by requesting the Arbitral Tribunal to determine, even before the matter of sovereignty is dealt with, the issue of compatibility of China' s maritime claims with the Convention. In relevant cases, no international judicial or arbitral body has ever applied the Convention to determine the maritime rights derived from a maritime feature before sovereignty over that feature is decided. 19. Secondly, in respect of the Nansha Islands, the Philippines selects only a few features and requests the Arbitral Tribunal to decide on their maritime entitlements. This is in essence an attempt at denying China' s sovereignty over the Nansha Islands as a whole. 20. 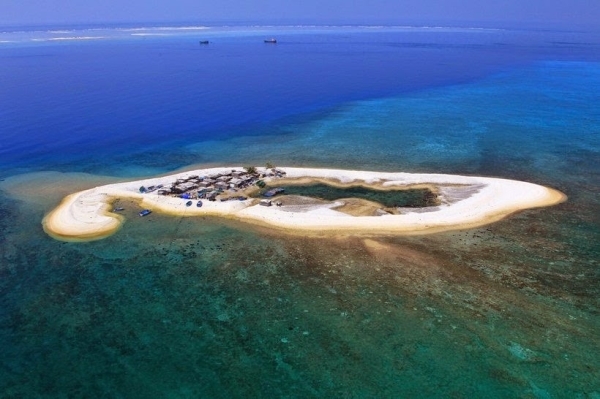 The Nansha Islands comprises many maritime features. China has always enjoyed sovereignty over the Nansha Islands in its entirety, not just over some features thereof. In 1935, the Commission of the Chinese Government for the Review of Maps of Land and Waters published the Map of Islands in the South China Sea. In 1948, the Chinese Government published the Map of the Location of the South China Sea Islands. Both maps placed under China' s sovereignty what are now known as the Nansha Islands as well as the Dongsha Islands, the Xisha Islands and the Zhongsha Islands. The Declaration of the Government of the People' s Republic of China on the Territorial Sea of 1958 declared that the territory of the People' s Republic of China includes, inter alia, the Nansha Islands. In 1983, the National Toponymy Commission of China published standard names for some of the South China Sea Islands, including those of the Nansha Islands. The Law of the People' s Republic of China on the Territorial Sea and the Contiguous Zone of 1992 again expressly provides that the Nansha Islands constitutes a part of the land territory of the People' s Republic of China. 21. In Note Verbale No. CML/8/2011 of 14 April 2011 addressed to Secretary-General of the United Nations, the Permanent Mission of China to the United Nations stated that 'under the relevant provisions of the 1982 United Nations Convention on the Law of the Sea, as well as the Law of the People' s Republic of China on the Territorial Sea and the Contiguous Zone (1992) and the Law on the Exclusive Economic Zone and the Continental Shelf of the People' s Republic of China (1998), China' s Nansha Islands is fully entitled to Territorial Sea, Exclusive Economic Zone (EEZ) and Continental Shelf.' It is plain that, in order to determine China' s maritime entitlements based on the Nansha Islands under the Convention, all maritime features comprising the Nansha Islands must be taken into account. 22. The Philippines, by requesting the Arbitral Tribunal to determine the maritime entitlements of only what it describes as the maritime features 'occupied or controlled by China' , has in effect dissected the Nansha Islands. It deliberately makes no mention of the rest of the Nansha Islands, including those illegally seized or claimed by the Philippines. Its real intention is to gainsay China' s sovereignty over the whole of the Nansha Islands, deny the fact of its illegal seizure of or claim on several maritime features of the Nansha Islands, and distort the nature and scope of the China-Philippines disputes in the South China Sea. In addition, the Philippines has deliberately excluded from the category of the maritime features 'occupied or controlled by China' the largest island in the Nansha Islands, Taiping Dao, which is currently controlled by the Taiwan authorities of China. This is a grave violation of the One-China Principle and an infringement of China' s sovereignty and territorial integrity. This further shows that the second category of claims brought by the Philippines essentially pertains to the territorial sovereignty dispute between the two countries. 23. Finally, whether or not low-tide elevations can be appropriated is plainly a question of territorial sovereignty. 24. The Philippines asserts that some of the maritime features, about which it has submitted claims for arbitration, are low-tide elevations, thus being incapable of appropriation as territory. As to whether those features are indeed low-tide elevations, this Position Paper will not comment. It should, however, be pointed out that, whatever nature those features possess, the Philippines itself has persisted in claiming sovereignty over them since the 1970s. By Presidential Decree No. 1596, promulgated on 11 June 1978, the Philippines made known its unlawful claim to sovereignty over some maritime features in the Nansha Islands including the aforementioned features, together with the adjacent but vast areas of waters, sea-bed, subsoil, continental margin and superjacent airspace, and constituted the vast area as a new municipality of the province of Palawan, entitled 'Kalayaan' . Notwithstanding that Philippine Republic Act No. 9522 of 10 March 2009 stipulates that the maritime zones for the so-called 'Kalayaan Island Group' (i.e., some maritime features of China' s Nansha Islands) and 'Scarborough Shoal' (i.e., China' s Huangyan Dao) be determined in a way consistent with Article 121 of the Convention (i.e., the regime of islands), this provision was designed to adjust the Philippines' maritime claims based on those features within the aforementioned area. The Act did not vary the territorial claim of the Philippines to the relevant maritime features, including those it alleged in this arbitration as low-tide elevations. In Note Verbale No. 000228, addressed to Secretary-General of the United Nations on 5 April 2011, the Philippine Permanent Mission to the United Nations stated that, 'the Kalayaan Island Group (KIG) constitutes an integral part of the Philippines. The Republic of the Philippines has sovereignty and jurisdiction over the geological features in the KIG.' The Philippines has maintained, to date, its claim to sovereignty over 40 maritime features in the Nansha Islands, among which are the very features it now labels as low-tide elevations. It is thus obvious that the only motive behind the Philippines' assertion that low-tide elevations cannot be appropriated is to deny China' s sovereignty over these features so as to place them under Philippine sovereignty. 25. Whether low-tide elevations can be appropriated as territory is in itself a question of territorial sovereignty, not a matter concerning the interpretation or application of the Convention. The Convention is silent on this issue of appropriation. In its 2001 Judgment in Qatar v. Bahrain, the ICJ explicitly stated that, 'International treaty law is silent on the question whether low-tide elevations can be considered to be 'territory' . Nor is the Court aware of a uniform and widespread State practice which might have given rise to a customary rule which unequivocally permits or excludes appropriation of low-tide elevations' (Qatar v. Bahrain, I.C.J. Reports 2001, pp. 101-102, para. 205). 'International treaty law' plainly includes the Convention, which entered into force in 1994. In its 2012 Judgment in Nicaragua v.
Colombia, while the ICJ stated that 'low-tide elevations cannot be appropriated' (Nicaragua v. Colombia, I.C.J. Reports 2012, p. 641, para. 26), it did not point to any legal basis for this conclusory statement. Nor did it touch upon the legal status of low-tide elevations as components of an archipelago, or sovereignty or claims of sovereignty that may have long existed over such features in a particular maritime area. On all accounts, the ICJ did not apply the Convention in that case. Whether or not low-tide elevations can be appropriated is not a question concerning the interpretation or application of the Convention. 26. As to the third category of the Philippines' claims, China maintains that the legality of China' s actions in the waters of the Nansha Islands and Huangyan Dao rests on both its sovereignty over relevant maritime features and the maritime rights derived therefrom. 27. The Philippines alleges that China' s claim to and exercise of maritime rights in the South China Sea have unlawfully interfered with the sovereign rights, jurisdiction and rights and freedom of navigation, which the Philippines is entitled to enjoy and exercise under the Convention. The premise for this claim must be that the spatial extent of the Philippines' maritime jurisdiction is defined and undisputed, and that China' s actions have encroached upon such defined areas. The fact is, however, to the contrary. China and the Philippines have not delimited the maritime space between them. Until and unless the sovereignty over the relevant maritime features is ascertained and maritime delimitation completed, this category of claims of the Philippines cannot be decided upon. 28. It should be particularly emphasized that China always respects the freedom of navigation and overflight enjoyed by all States in the South China Sea in accordance with international law. 29. To sum up, by requesting the Arbitral Tribunal to apply the Convention to determine the extent of China' s maritime rights in the South China Sea, without first having ascertained sovereignty over the relevant maritime features, and by formulating a series of claims for arbitration to that effect, the Philippines contravenes the general principles of international law and international jurisprudence on the settlement of international maritime disputes. To decide upon any of the Philippines' claims, the Arbitral Tribunal would inevitably have to determine, directly or indirectly, the sovereignty over both the maritime features in question and other maritime features in the South China Sea. Besides, such a decision would unavoidably produce, in practical terms, the effect of a maritime delimitation, which will be further discussed below in Part IV of this Position Paper. Therefore, China maintains that the Arbitral Tribunal manifestly has no jurisdiction over the present case. 30. With regard to disputes concerning territorial sovereignty and maritime rights, China has always maintained that they should be peacefully resolved through negotiations between the countries directly concerned. In the present case, there has been a long-standing agreement between China and the Philippines on resolving their disputes in the South China Sea through friendly consultations and negotiations. 31. Under the Joint Statement between the People' s Republic of China and the Republic of the Philippines concerning Consultations on the South China Sea and on Other Areas of Cooperation, issued on 10 August 1995, both sides 'agreed to abide by' the principles that '[d]isputes shall be settled in a peaceful and friendly manner through consultations on the basis of equality and mutual respect' (Point 1); that 'a gradual and progressive process of cooperation shall be adopted with a view to eventually negotiating a settlement of the bilateral disputes' (Point 3); and that '[d]isputes shall be settled by the countries directly concerned without prejudice to the freedom of navigation in the South China Sea' (Point 8). 32. The Joint Statement of the China-Philippines Experts Group Meeting on Confidence-Building Measures, issued on 23 March 1999, states that the two sides reiterated their commitment to '[t]he understanding to continue to work for a settlement of their difference through friendly consultations' (para. 5), and that 'the two sides believe that the channels of consultations between China and the Philippines are unobstructed. They have agreed that the dispute should be peacefully settled through consultation' (para. 12). 33. The Joint Statement between the Government of the People' s Republic of China and the Government of the Republic of the Philippines on the Framework of Bilateral Cooperation in the Twenty-First Century, issued on 16 May 2000, states in Point 9 that, 'The two sides commit themselves to the maintenance of peace and stability in the South China Sea. They agree to promote a peaceful settlement of disputes through bilateral friendly consultations and negotiations in accordance with universally-recognized principles of international law, including the 1982 United Nations Convention on the Law of the Sea. They reaffirm their adherence to the 1995 joint statement between the two countries on the South China Sea ...' . 37. Between 30 August and 3 September 2011, President Benigno S. Aquino III of the Philippines paid a State visit to China. On 1 September 2011, the two sides issued a Joint Statement between the People' s Republic of China and the Republic of the Philippines, which, in paragraph 15, 'reiterated their commitment to addressing the disputes through peaceful dialogue' and 'reaffirmed their commitments to respect and abide by the Declaration on the Conduct of Parties in the South China Sea signed by China and the ASEAN member countries in 2002' . The Joint Statement, consequently, reaffirmed Paragraph 4 of the DOC relating to settlement of relevant disputes by negotiations. 38. The bilateral instruments between China and the Philippines repeatedly employ the term 'agree' when referring to settlement of their disputes through negotiations. This evinces a clear intention to establish an obligation between the two countries in this regard. Paragraph 4 of the DOC employs the term 'undertake' , which is also frequently used in international agreements to commit the parties to their obligations. As the ICJ observed in its Judgment in Bosnia and Herzegovina v. Serbia and Montenegro, '[t]he ordinary meaning of the word 'undertake' is to give a formal promise, to bind or engage oneself, to give a pledge or promise, to agree, to accept an obligation. It is a word regularly used in treaties setting out the obligations of the Contracting Parties .... It is not merely hortatory or purposive' (Application of the Convention on the Prevention and Punishment of the Crime of Genocide (Bosnia and Herzegovina v. Serbia and Montenegro), Judgment of 26 February 2007, I.C.J. Reports 2007, p. 111, para. 162). Furthermore, under international law, regardless of the designation or form the above-mentioned instruments employ, as long as they intend to create rights and obligations for the parties, these rights and obligations are binding between the parties (Cf. Maritime Delimitation and Territorial Questions between Qatar and Bahrain (Qatar v. Bahrain), Jurisdiction and Admissibility, Judgment of 1 July 1994, I.C.J. Reports 1994, pp. 120-121, paras. 22-26; Land and Maritime Boundary between Cameroon and Nigeria (Cameroon v. Nigeria: Equitorial Guinea intervening), Judgment of 10 October 2002, I.C.J. Reports 2002, pp. 427, 429, paras. 258, 262-263). 39. The relevant provisions in the aforementioned bilateral instruments and the DOC are mutually reinforcing and form an agreement between China and the Philippines. On that basis, they have undertaken a mutual obligation to settle their relevant disputes through negotiations. 40. By repeatedly reaffirming negotiations as the means for settling relevant disputes, and by emphasizing that negotiations be conducted by sovereign States directly concerned, the above-quoted provisions of the bilateral instruments and Paragraph 4 of the DOC obviously have produced the effect of excluding any means of third-party settlement. In particular, the above-mentioned Joint Statement between the People' s Republic of China and the Republic of the Philippines concerning Consultations on the South China Sea and on Other Areas of Cooperation of 10 August 1995 stipulates in Point 3 that 'a gradual and progressive process of cooperation shall be adopted with a view to eventually negotiating a settlement of the bilateral disputes' . The term 'eventually' in this context clearly serves to emphasize that 'negotiations' is the only means the parties have chosen for dispute settlement, to the exclusion of any other means including third-party settlement procedures. Although the above-mentioned bilateral instruments and Paragraph 4 of the DOC do not use such an express phrase as 'exclude other procedures of dispute settlement' , as the arbitral tribunal in the Southern Bluefin Tuna Case stated in its Award, 'the absence of an express exclusion of any procedure ... is not decisive' (Australia and New Zealand v. Japan, Award on Jurisdiction and Admissibility, 4 August 2000, p.97, para. 57). As discussed earlier, in respect of disputes relating to territorial sovereignty and maritime rights, China always insists on peaceful settlement of disputes by means of negotiations between the countries directly concerned. China' s position on negotiations was made clear and well known to the Philippines and other relevant parties during the drafting and adoption of the aforementioned bilateral instruments and the DOC. 41. Consequently, with regard to all the disputes between China and the Philippines in the South China Sea, including the Philippines' claims in this arbitration, the only means of settlement as agreed by the two sides is negotiations, to the exclusion of any other means. 42. Even supposing that the Philippines' claims were concerned with the interpretation or application of the Convention, the compulsory procedures laid down in section 2 of Part XV of the Convention still could not be applied, given the agreement between China and the Philippines on settling their relevant disputes through negotiations. 44. As analysed above, through bilateral and multilateral instruments, China and the Philippines have agreed to settle their relevant disputes by negotiations, without setting any time limit for the negotiations, and have excluded any other means of settlement. In these circumstances, it is evident that, under the above-quoted provisions of the Convention, the relevant disputes between the two States shall be resolved through negotiations and there shall be no recourse to arbitration or other compulsory procedures. 45. The Philippines claims that, the two countries have been involved in exchanges of views since 1995 with regard to the subject-matter of the Philippines' claims for arbitration, without however reaching settlement, and that in its view, the Philippines is justified in believing that it is meaningless to continue the negotiations, and therefore the Philippines has the right to initiate arbitration. But the truth is that the two countries have never engaged in negotiations with regard to the subject-matter of the arbitration. 46. Under international law, general exchanges of views, without having the purpose of settling a given dispute, do not constitute negotiations. In Georgia v. Russian Federation, the ICJ held that, 'Negotiations entail more than the plain opposition of legal views or interests between two parties, or the existence of a series of accusations and rebuttals, or even the exchange of claims and directly opposed counter-claims. As such, the concept of 'negotiations' ... requires - at the very least - a genuine attempt by one of the disputing parties to engage in discussions with the other disputing party, with a view to resolving the dispute' (Application of the International Convention on the Elimination of All Forms of Racial Discrimination (Georgia v. Russian Federation), Preliminary Objections, Judgment of 1 April 2011, I.C.J. Reports 2011, p. 132, para. 157). In addition, the ICJ considered that 'the subject-matter of the negotiations must relate to the subject-matter of the dispute which, in turn, must concern the substantive obligations contained in the treaty in question' (Ibid., p. 133, para. 161). 47. The South China Sea issue involves a number of countries, and it is no easy task to solve it. Up to the present, the countries concerned are still working together to create conditions conducive to its final settlement by negotiations. Against this background, the exchanges of views between China and the Philippines in relation to their disputes have so far pertained to responding to incidents at sea in the disputed areas and promoting measures to prevent conflicts, reduce frictions, maintain stability in the region, and promote measures of cooperation. They are far from constituting negotiations even on the evidence presented by the Philippines. 48. In recent years, China has on a number of occasions proposed to the Philippines the establishment of a China-Philippines regular consultation mechanism on maritime issues. To date, there has never been any response from the Philippines. On 1 September 2011, the two countries issued a Joint Statement between the People' s Republic of China and the Republic of Philippines, reiterating the commitment to settling their disputes in the South China Sea through negotiations. But, before negotiations could formally begin, the Philippines sent on 10 April 2012 a naval vessel to the waters of China' s Huangyan Dao to seize Chinese fishing boats together with the Chinese fishermen on board. In the face of such provocations, China was forced to take response measures to safeguard its sovereignty. Thereafter, China once again proposed to the Philippine Government that the two sides restart the China-Philippines consultation mechanism for confidence-building measures. That proposal again fell on deaf ears. On 26 April 2012, the Philippine Department of Foreign Affairs delivered a note verbale to the Chinese Embassy in the Philippines, proposing that the issue of Huangyan Dao be referred to a third-party adjudication body for resolution and indicating no willingness to negotiate. On 22 January 2013, the Philippines unilaterally initiated the present compulsory arbitration proceedings. 49. The previous exchanges of views regarding the South China Sea issue between the two countries did not concern the subject-matter of the Philippines' claims for arbitration. For instance, the Philippines cited a statement released by the Chinese Foreign Ministry on 22 May 1997 regarding Huangyan Dao, in order to show that there exists between the two countries a dispute concerning the maritime rights of Huangyan Dao and that the two countries had exchanged views with regard to that dispute. However, the Philippines deliberately omitted a passage from that statement, which reads: 'The issue of Huangyandao is an issue of territorial sovereignty; the development and exploitation of the EEZ is a question of maritime jurisdiction, the nature of the two issues are different and hence the laws and regulations governing them are also different, and they should not be discussed together. The attempt of the Philippine side to use maritime jurisdictional rights to violate the territorial sovereignty of China is untenable.' This passage makes clear the thrust of the statement: the Philippines shall not negate China' s sovereignty over Huangyan Dao on the pretext that it is situated within the EEZ of the Philippines. This shows that the exchange of views in question was centred on the issue of sovereignty. 50. It should be further noted that, the Philippines has attempted to show that the subject-matter of the exchanges of views between China and the Philippines since 1995 concerns the interpretation or application of the Convention, but nothing could be farther from the truth than this. Historically, the Philippines, by Republic Act No. 3046 of 17 June 1961, proclaimed as part of its territorial sea the vast areas of sea between the most outlying islands in the Philippine archipelago and the treaty limits established in the Treaty of Paris concluded between the United States and Spain in 1898, among other international treaties, thus claiming a belt of territorial sea far beyond 12 nautical miles. By Presidential Decree No. 1596 promulgated on 11 June 1978, the Philippines made its claim for sovereignty over the so-called 'Kalayaan Island Group' (i.e., some maritime features of China' s Nansha Islands), together with the adjacent but vast areas of waters, sea-bed, subsoil, continental margin, and superjacent airspace. As conceded by the Philippines itself, only with the adoption on 10 March 2009 of Republic Act No. 9522 did it begin the ongoing process to harmonize its domestic law with the Convention, with a view to eventually relinquishing all its maritime claims incompatible with the Convention. That Act provided, for the first time, that the maritime areas of the so-called 'Kalayaan Island Group' (i.e., some maritime features of China' s Nansha Islands) and 'Scarborough Shoal' (i.e., China' s Huangyan Dao) 'shall be determined' so as to be 'consistent with Article 121' of the Convention (i.e., the regime of islands). Therefore, given that the Philippines itself considers that only in 2009 did it start to abandon its former maritime claims in conflict with the Convention, how could it have started in 1995 to exchange views with China on matters concerning the interpretation or application of the Convention that are related to the present arbitration? 51. The Philippines claims that China cannot invoke Paragraph 4 of the DOC to exclude the jurisdiction of the Arbitral Tribunal, given its own grave breach of the terms of the DOC. This is groundless. In support of its allegations against China, the Philippines claims that China has taken measures including the threat of force to drive away Philippine fishermen from the waters of Huangyan Dao in spite of their long-standing and continuous fishing activities in those waters, and that China has blocked the Philippines from resupplying a naval ship which ran and has stayed aground at Ren' ai Jiao and certain navy personnel on board. But the fact is that, regarding the situation at Huangyan Dao, it was the Philippines that first resorted to the threat of force by dispatching on 10 April 2012 a naval vessel to detain and arrest Chinese fishing boats and fishermen in the waters of Huangyan Dao. Regarding the situation at Ren' ai Jiao, which is a constituent part of China' s Nansha Islands, the Philippines illegally ran a naval ship aground in May 1999 at that feature on the pretext of 'technical difficulties' . China has made repeated representations to the Philippines, demanding that the latter immediately tow away the vessel. The Philippines, for its part, had on numerous occasions made explicit undertaking to China to tow away the vessel grounded due to 'technical difficulties' . However, for over 15 years, instead of fulfilling that undertaking, the Philippines has attempted to construct permanent installations on Ren' ai Jiao. On 14 March 2014, the Philippines even openly declared that the vessel was deployed as a permanent installation on Ren' ai Jiao in 1999. China has been forced to take necessary measures in response to such provocative conduct. In light of these facts, the Philippines' accusations against China are baseless. 52. While it denies the effect of Paragraph 4 of the DOC for the purpose of supporting its institution of the present arbitration, the Philippines recently called on the parties to the DOC to comply with Paragraph 5 of the DOC and to provide 'the full and effective implementation of the DOC' , in a proposal made in its Department of Foreign Affairs statement dated 1 August 2014. This selective and self-contradictory tactic clearly violates the principle of good faith in international law. 53. The principle of good faith requires all States to honestly interpret agreements they enter into with others, not to misinterpret them in disregard of their authentic meaning in order to obtain an unfair advantage. This principle is of overriding importance and is incorporated in Article 2(2) of the Charter of the United Nations. It touches every aspect of international law (Cf. Sir Robert Jennings and Sir Arthur Watts (eds. ), Oppenheim' s International Law, 9th ed., 1992, vol. 1, p. 38). In the Nuclear Tests Case, the ICJ held that, 'One of the basic principles governing the creation and performance of legal obligations, whatever their source, is the principle of good faith. Trust and confidence are inherent in international co-operation' (Nuclear Tests Case (Australia v. France), Judgment of 20 December 1974, I.C.J. Reports 1974, p. 268, para. 46). 54. On this occasion, China wishes to emphasize that the DOC is an important instrument, adopted by China and the ASEAN member States following many years of arduous negotiations on the basis of mutual respect, mutual understanding and mutual accommodation. Under the DOC, the parties concerned undertake to resolve their territorial and jurisdictional disputes through friendly consultations and negotiations by sovereign States directly concerned. In addition, the parties reaffirm their commitment to the purposes and principles of the Charter of the United Nations, the 1982 Convention, the Treaty of Amity and Cooperation in Southeast Asia, the Five Principles of Peaceful Coexistence, and other universally recognized principles of international law which shall serve as the basic norms governing state-to-state relations. The Parties commit themselves to exploring ways for building trust and confidence in accordance with the above-mentioned principles and on the basis of equality and mutual respect; reaffirm their respect for and commitment to the freedom of navigation in, and overflight above, the South China Sea as provided for by universally recognized principles of international law, including the 1982 Convention; and undertake to exercise self-restraint in the conduct of activities that would complicate or escalate disputes and affect peace and stability including, among others, refraining from action of inhabiting on the presently uninhabited islands, reefs, shoals, cays, and other features, and to handle their differences in a constructive manner. The DOC also lists a number of ways to build trust and areas of cooperation for the Parties concerned to seek and explore pending the peaceful settlement of territorial and jurisdictional disputes. As a follow-up to the DOC, the parties have undertaken to negotiate a 'Code of Conduct in the South China Sea'. 55. The DOC has played a positive role in maintaining stability in the South China Sea, and in enhancing maritime cooperation, building trust and reducing misgivings between China and the ASEAN member States. Every provision of the DOC constitutes an integral part of the document. To deny the significance of the DOC will lead to a serious retrogression from the current relationship of cooperation between China and the ASEAN member States in the South China Sea. 56. As a member of the ASEAN and having been involved throughout the consultations on the DOC, the Philippines should have fully appreciated the significance of the DOC for the peaceful settlement of the disputes in the South China Sea through negotiations. At present, in order to maintain stability in the region and create conditions for peaceful settlement of the South China Sea issue, China and the ASEAN member States have established working mechanisms to effectively implement the DOC, and have been engaged in consultations regarding the 'Code of Conduct in the South China Sea' . By initiating compulsory arbitration at this juncture, the Philippines is running counter to the common wish and joint efforts of China and the ASEAN member States. Its underlying goal is not, as the Philippines has proclaimed, to seek peaceful resolution of the South China Sea issue, but rather, by resorting to arbitration, to put political pressure on China, so as to deny China' s lawful rights in the South China Sea through the so-called 'interpretation or application' of the Convention, and to pursue a resolution of the South China Sea issue on its own terms. This is certainly unacceptable to China. 57. Part XV of the Convention establishes the right for the States Parties to file a written declaration to exclude specified categories of disputes from the compulsory dispute settlement procedures as laid down in section 2 of that Part. In 2006 China filed such a declaration in full compliance with the Convention. 58. On 25 August 2006, China deposited, pursuant to Article 298 of the Convention, with Secretary-General of the United Nations a written declaration, stating that, 'The Government of the People' s Republic of China does not accept any of the procedures provided for in section 2 of Part XV of the Convention with respect to all the categories of disputes referred to in paragraph 1 (a), (b) and (c) of Article 298 of the Convention' . In other words, as regards disputes concerning maritime delimitation, historic bays or titles, military and law enforcement activities, and disputes in respect of which the Security Council of the United Nations is exercising the functions assigned to it by the Charter of the United Nations, the Chinese Government does not accept any of the compulsory dispute settlement procedures laid down in section 2 of Part XV of the Convention, including compulsory arbitration. China firmly believes that the most effective means for settlement of maritime disputes between China and its neighbouring States is that of friendly consultations and negotiations between the sovereign States directly concerned. 59. China and the Philippines are maritime neighbours and 'States with opposite or adjacent coasts' in the sense of Articles 74 and 83 of the Convention. There exists an issue of maritime delimitation between the two States. Given that disputes between China and the Philippines relating to territorial sovereignty over relevant maritime features remain unresolved, the two States have yet to start negotiations on maritime delimitation. They have, however, commenced cooperation to pave the way for an eventual delimitation. 60. On 3 September 2004, the two sides issued a Joint Press Statement of the Government of the People' s Republic of China and the Government of the Republic of the Philippines, stating that '[t]he two sides reaffirmed their commitment to the peace and stability in the South China Sea and their readiness to continue discussions to study cooperative activities like joint development pending the comprehensive and final settlement of territorial disputes and overlapping maritime claims in the area' (para. 16). 61. Two days before the issuance of the Joint Press Statement, upon approval by both governments and in the presence of the Heads of State of the two countries, China National Offshore Oil Corporation and Philippine National Oil Company signed the 'Agreement for Joint Marine Seismic Undertaking in Certain Areas in the South China Sea' . On 14 March 2005, the agreement was expanded to a tripartite agreement, with the participation of Vietnam Oil and Gas Corporation. This is a good example of the constructive efforts made by the States concerned to enhance cooperation and create conditions for a negotiated settlement of the disputes in the South China Sea. The maritime area covered by that agreement is within that covered in the present arbitration initiated by the Philippines. 62. On 28 April 2005, during a State visit to the Philippines by the then Chinese President Hu Jintao, China and the Philippines issued a Joint Statement of the People' s Republic of China and the Republic of the Philippines, in which the two sides 'agreed to continue efforts to maintain peace and stability in the South China Sea and ... welcomed the signing of the Tripartite Agreement for Joint Marine Seismic Undertaking in the Agreement Area in the South China Sea by China National Offshore Oil Corporation, Vietnam Oil and Gas Corporation and Philippine National Oil Company' (para. 16). 63. On 16 January 2007, during the official visit to the Philippines by the then Chinese Premier Wen Jiabao, China and the Philippines issued a Joint Statement of the People' s Republic of China and the Republic of the Philippines, which stated that 'the Tripartite Joint Marine Seismic Undertaking in the South China Sea serves as a model for cooperation in the region. They agreed that possible next steps for cooperation among the three parties should be explored to bring collaboration to a higher level and increase the momentum of trust and confidence in the region' (para. 12). 64. In light of the above, it is plain that China and the Philippines have reached mutual understanding to advance final resolution of the issue of maritime delimitation through cooperation. In any event, given China' s 2006 declaration, the Philippines should not and cannot unilaterally initiate compulsory arbitration on the issue of maritime delimitation. 65. To cover up the maritime delimitation nature of the China-Philippines dispute and to sidestep China' s 2006 declaration, the Philippines has split up the dispute of maritime delimitation into discrete issues and selected a few of them for arbitration, requesting the Arbitral Tribunal to render the so-called 'legal interpretation' on each of them. 66. It is not difficult to see that such legal issues as those presented by the Philippines in the present arbitration, including maritime claims, the legal nature of maritime features, the extent of relevant maritime rights, and law enforcement activities at sea, are all fundamental issues dealt with in past cases of maritime delimitation decided by international judicial or arbitral bodies and in State practice concerning maritime delimitation. In short, those issues are part and parcel of maritime delimitation. 67. Maritime delimitation is an integral, systematic process. Articles 74 and 83 of the Convention stipulate that maritime delimitation between States with opposite or adjacent coasts 'shall be effected by agreement on the basis of international law, as referred to in Article 38 of the Statute of the International Court of Justice, in order to achieve an equitable solution' . Both international jurisprudence and State practice have recognized that all relevant factors must be taken into account to achieve an equitable solution. In this light, the international law applicable to maritime delimitation includes both the Convention and general international law. Under this body of law, maritime delimitation involves a consideration of not only entitlements, effect of maritime features, and principles and methods of delimitation, but also all relevant factors that must be taken into account, in order to attain an equitable solution. 68. The issues presented by the Philippines for arbitration constitute an integral part of maritime delimitation between China and the Philippines, and, as such, can only be considered under the overarching framework of maritime delimitation between China and the Philippines, and in conjunction with all the relevant rights and interests the parties concerned enjoy in accordance with the Convention, general international law, and historical or long-standing practice in the region for overall consideration. The Philippines' approach of splitting its maritime delimitation dispute with China and selecting some of the issues for arbitration, if permitted, will inevitably destroy the integrity and indivisibility of maritime delimitation and contravene the principle that maritime delimitation must be based on international law as referred to in Article 38 of the ICJ Statute and that 'all relevant factors must be taken into account' . This will adversely affect the future equitable solution of the dispute of maritime delimitation between China and the Philippines. 69. Ostensibly, the Philippines is not seeking from the Arbitral Tribunal a ruling regarding maritime delimitation, but instead a decision, inter alia, that certain maritime features are part of the Philippines' EEZ and continental shelf, and that China has unlawfully interfered with the enjoyment and exercise by the Philippines of sovereign rights in its EEZ and continental shelf. But that obviously is an attempt to seek a recognition by the Arbitral Tribunal that the relevant maritime areas are part of the Philippines' EEZ and continental shelf, in respect of which the Philippines is entitled to exercise sovereign rights and jurisdiction. This is actually a request for maritime delimitation by the Arbitral Tribunal in disguise. The Philippines' claims have in effect covered the main aspects and steps in maritime delimitation. Should the Arbitral Tribunal address substantively the Philippines' claims, it would amount to a de facto maritime delimitation. 70. The exclusionary declarations filed by the States Parties to the Convention under Article 298 of the Convention must be respected. By initiating the present compulsory arbitration as an attempt to circumvent China' s 2006 declaration, the Philippines is abusing the dispute settlement procedures under the Convention. 71. China' s 2006 declaration, once filed, automatically comes into effect. Its effect, as prescribed under Article 299 of the Convention, is that, without the consent of China, no State Party can unilaterally invoke any of the compulsory procedures specified in section 2 of Part XV against China in respect of the disputes covered by that declaration. In return, China simultaneously gives up the right to unilaterally initiate compulsory procedures against other States Parties in respect of the same disputes. The rights and obligations are reciprocal in this regard. 72. The Philippines claims that, having chosen none of the four compulsory dispute settlement procedures listed under Article 287 of the Convention, China as a State Party shall therefore be deemed to have accepted compulsory arbitration. This is a deliberately misleading argument. The purpose and the effect of China' s 2006 declaration is such that the disputes listed therein are fully excluded from the compulsory settlement procedures under the Convention. Whether or not China has selected any of the four compulsory procedures under Article 287, as long as a dispute falls within the scope of China' s 2006 declaration, China has already explicitly excluded it from the applicability of any compulsory procedures under section 2 of Part XV of the Convention, including compulsory arbitration. 73. Although the Philippines professes that the subject-matter of the arbitration does not involve any dispute covered by China' s 2006 declaration, since China holds a different view in this regard, the Philippines should first take up this issue with China, before a decision can be taken on whether or not it can be submitted for arbitration. Should the Philippines' logic in its present form be followed, any State Party may unilaterally initiate compulsory arbitration against another State Party in respect of a dispute covered by the latter' s declaration in force simply by asserting that the dispute is not excluded from arbitration by that declaration. This would render the provisions of Article 299 meaningless. 74. Since the entry into force of the Convention, the present arbitration is the first case in which a State Party has unilaterally initiated compulsory arbitration in respect of a dispute covered by a declaration of another State Party under Article 298. If this twisted approach of the Philippines could be accepted as fulfilling the conditions for invoking compulsory arbitration, it could be well imagined that any of the disputes listed in Article 298 may be submitted to the compulsory procedures under section 2 of Part XV simply by connecting them, using the Philippines' approach, with the question of interpretation or application of certain provisions of the Convention. Should the above approach be deemed acceptable, the question would then arise as to whether the provisions of Article 298 could still retain any value, and whether there is any practical meaning left of the declarations so far filed by 35 States Parties under Article 298. In light of the foregoing reasons, China can only conclude that, the unilateral initiation by the Philippines of the present arbitration constitutes an abuse of the compulsory procedures provided in the Convention and a grave challenge to the solemnity of the dispute settlement mechanism under the Convention. 75. To sum up, even assuming that the subject-matter of the arbitration were concerned with the interpretation or application of the Convention, it would still be an integral part of the dispute of maritime delimitation between the two States. Having been excluded by China' s 2006 declaration, it could not be submitted to compulsory arbitration under the Convention. 76. Under international law, every State is free to choose the means of dispute settlement. The jurisdiction of any international judicial or arbitral body over an inter-State dispute depends on the prior consent of the parties to the dispute. This is known as the principle of consent in international law. It was on the basis of this principle that the States participating in the Third United Nations Conference on the Law of the Sea reached, after extended and arduous negotiations, a compromise on Part XV relating to dispute settlement as a package deal. 77. The compulsory dispute settlement procedures provided in Part XV of the Convention apply only to disputes concerning the interpretation or application of the Convention. States Parties are entitled to freely choose the means of settlement other than those set out in Part XV. Articles 297 and 298 of the Convention, moreover, provide for limitations on and optional exceptions to the applicability of the compulsory procedures with regard to specified categories of disputes. 78. The balance embodied in the provisions of Part XV has been a critical factor for the decision of many States to become parties to the Convention. At the second session of the Third United Nations Conference on the Law of the Sea, Ambassador Reynaldo Galindo Pohl of El Salvador, co-chair of the informal group on the settlement of disputes, on introducing the first general draft on dispute settlement, emphasized the need for exceptions from compulsory jurisdiction with respect to questions directly related to the territorial integrity of States. Otherwise, as has been noted, 'a number of States might have been dissuaded from ratifying the Convention or even signing it' (Shabtai Rosenne and Louis B. Sohn (eds. ), United Nations Convention on the Law of the Sea 1982: A Commentary, 1989, vol. v, p. 88, para. 297.1). It follows that the provisions of Part XV must be interpreted and applied in such a manner so as to preserve the balance in and the integrity of Part XV. 79. China highly values the positive role played by the compulsory dispute settlement procedures of the Convention in upholding the international legal order for the oceans. As a State Party to the Convention, China has accepted the provisions of section 2 of Part XV on compulsory dispute settlement procedures. But that acceptance does not mean that those procedures apply to disputes of territorial sovereignty, or disputes which China has agreed with other States Parties to settle by means of their own choice, or disputes already excluded by Article 297 and China' s 2006 declaration filed under Article 298. With regard to the Philippines' claims for arbitration, China has never accepted any of the compulsory procedures of section 2 of Part XV. 81. The means thus chosen by the States Parties to the Convention takes priority over the compulsory procedures set forth in section 2 of Part XV. Article 281(1) of section 1 of Part XV provides that, 'If the States Parties which are parties to a dispute concerning the interpretation or application of this Convention have agreed to seek settlement of the dispute by a peaceful means of their own choice, the procedures provided for in this Part apply only where no settlement has been reached by recourse to such means and the agreement between the parties does not exclude any further procedure.' Article 286 states that, 'Subject to section 3, any dispute concerning the interpretation or application of this Convention shall, where no settlement has been reached by recourse to section 1, be submitted at the request of any party to the dispute to the court or tribunal having jurisdiction under this section.' Accordingly, where parties to a dispute have already chosen a means of settlement and excluded other procedures, the compulsory procedures of the Convention shall not apply to the dispute in question. 82. The priority and significance of the means of dispute settlement chosen by States Parties to the Convention have been further affirmed in the arbitral award in the Southern Bluefin Tuna Case. The tribunal recognized that the Convention 'falls significantly short of establishing a truly comprehensive regime of compulsory jurisdiction entailing binding decisions' , and that 'States Parties ... are permitted by Article 281(1) to confine the applicability of compulsory procedures of section 2 of Part XV to cases where all parties to the dispute have agreed upon submission of their dispute to such compulsory procedures' (Australia and New Zealand v. Japan, pp. 102-103, para. 62). Were the provisions of section 1 of Part XV not complied with faithfully, it would result in deprivation of the right of the States Parties to freely choose means of peaceful settlement based on State sovereignty. That would entail a breach of the principle of consent and upset the balance in and integrity of Part XV. 83. In exercise of its power to decide on its jurisdiction, any judicial or arbitral body should respect the right of the States Parties to the Convention to freely choose the means of settlement. Article 288(4) of the Convention provides that '[i]n the event of a dispute as to whether a court or tribunal has jurisdiction, the matter shall be settled by decision of that court or tribunal' . China respects that competence of judicial or arbitral bodies under the Convention. Equally important, China would like to emphasize, the exercise of judicial or arbitral power shall not derogate from the right of the States Parties to choose the means of settlement of their own accord, or from the principle of consent which must be followed in international adjudication and arbitration. China holds that this is the constraint that the Arbitral Tribunal must abide by when considering whether or not to apply Article 288(4) in determining its jurisdiction in the present arbitration. After all, 'the parties to the dispute are complete masters of the procedure to be used to settle it' (Shabtai Rosenne and Louis B. Sohn (eds. ), United Nations Convention on the Law of the Sea 1982: A Commentary, 1989, vol. v, p. 20, para. 280.1). 84. China respects the right of all States Parties to invoke the compulsory procedures in accordance with the Convention. At the same time, it would call attention to Article 300 of the Convention, which provides that, 'States Parties shall fulfil in good faith the obligations assumed under this Convention and shall exercise the rights, jurisdiction and freedoms recognized in this Convention in a manner which would not constitute an abuse of right.' While being fully aware that its claims essentially deal with territorial sovereignty, that China has never accepted any compulsory procedures in respect of those claims, and that there has been an agreement existing between the two States to settle their relevant disputes by negotiations, the Philippines has nevertheless initiated, by unilateral action, the present arbitration. This surely contravenes the relevant provisions of the Convention, and does no service to the peaceful settlement of the disputes. 85. In view of what is stated above and in light of the manifest lack of jurisdiction on the part of the Arbitral Tribunal, the Chinese Government has decided not to accept or participate in the present arbitration, in order to preserve China' s sovereign right to choose the means of peaceful settlement of its own free will and the effectiveness of its 2006 declaration, and to maintain the integrity of Part XV of the Convention as well as the authority and solemnity of the international legal regime for the oceans. This position of China will not change. 86. It is the view of China that the Arbitral Tribunal manifestly has no jurisdiction over this arbitration, unilaterally initiated by the Philippines, with regard to disputes between China and the Philippines in the South China Sea. Fourthly, China has never accepted any compulsory procedures of the Convention with regard to the Philippines' claims for arbitration. The Arbitral Tribunal shall fully respect the right of the States Parties to the Convention to choose the means of dispute settlement of their own accord, and exercise its competence to decide on its jurisdiction within the confines of the Convention. The initiation of the present arbitration by the Philippines is an abuse of the compulsory dispute settlement procedures under the Convention. There is a solid basis in international law for China' s rejection of and non-participation in the present arbitration. 87. China consistently adheres to the policy of friendly relations with its neighbouring States, and strives for fair and equitable solution in respect of disputes of territorial sovereignty and maritime delimitation by way of negotiations on the basis of equality and the Five Principles of Peaceful Co-existence. China holds that negotiations is always the most direct, effective, and universally used means for peaceful settlement of international disputes. 88. After years of diplomatic efforts and negotiations, China has successfully resolved land boundary disputes with twelve out of its fourteen neighbours, delimiting and demarcating some 20,000 kilometres in length of land boundary in the process, which accounts for over 90% of the total length of China' s land boundary. On 25 December 2000, China and Vietnam concluded, following negotiations, the Agreement between the People' s Republic of China and the Socialist Republic of Viet Nam on the Delimitation of the Territorial Seas, the Exclusive Economic Zones and Continental Shelves in Beibu Bay, establishing a maritime boundary between the two States in Beibu Bay. On 11 November 1997, the Agreement on Fisheries between the People' s Republic of China and Japan was signed. On 3 August 2000, the Agreement on Fisheries between the Government of the People' s Republic of China and the Government of the Republic of Korea was signed. On 24 December 2005, the Agreement between the Government of the People' s Republic of China and the Government of the Democratic People' s Republic of Korea for Joint Development of Oil Resources at Sea was signed. All these are provisional arrangements pending the maritime delimitation between China and those States. 89. The facts show that, as long as States concerned negotiate in good faith and on the basis of equality and mutual benefit, territorial and maritime delimitation disputes can be resolved properly between them. This principle and position of China equally apply to its disputes with the Philippines in the South China Sea. 90. China does not consider submission by agreement of a dispute to arbitration as an unfriendly act. In respect of disputes of territorial sovereignty and maritime rights, unilateral resort to compulsory arbitration against another State, however, cannot be taken as a friendly act, when the initiating State is fully aware of the opposition of the other State to the action and the existing agreement between them on dispute settlement through negotiations. Furthermore, such action cannot be regarded as in conformity with the rule of law, as it runs counter to the basic rules and principles of international law. It will not in any way facilitate a proper settlement of the dispute between the two countries. Instead it will undermine mutual trust and further complicate the bilateral relations. 91. In recent years, the Philippines has repeatedly taken new provocative actions in respect of Huangyan Dao and Ren' ai Jiao. Such actions have gravely hindered mutual political trust between China and the Philippines, and undermined the amicable atmosphere for China and ASEAN member States to implement the DOC and consult on the proposed Code of Conduct in the South China Sea. In fact, in the region of Southeast Asia, it is not China that has become 'increasingly assertive' ; it is the Philippines that has become increasingly provocative. 92. The issue of the South China Sea involves a number of States, and is compounded by complex historical background and sensitive political factors. Its final resolution demands patience and political wisdom from all parties concerned. China always maintains that the parties concerned shall seek proper ways and means of settlement through consultations and negotiations on the basis of respect for historical facts and international law. Pending final settlement, all parties concerned should engage in dialogue and cooperation to preserve peace and stability in the South China Sea, enhance mutual trust, clear up doubts, and create conditions for the eventual resolution of the issue. 93. The unilateral initiation of the present arbitration by the Philippines will not change the history and fact of China' s sovereignty over the South China Sea Islands and the adjacent waters; nor will it shake China' s resolve and determination to safeguard its sovereignty and maritime rights and interests; nor will it affect the policy and position of China to resolve the relevant disputes by direct negotiations and work together with other States in the region to maintain peace and stability in the South China Sea. Indonesia-Australia Ties: Joint Patrols in the South China Sea?